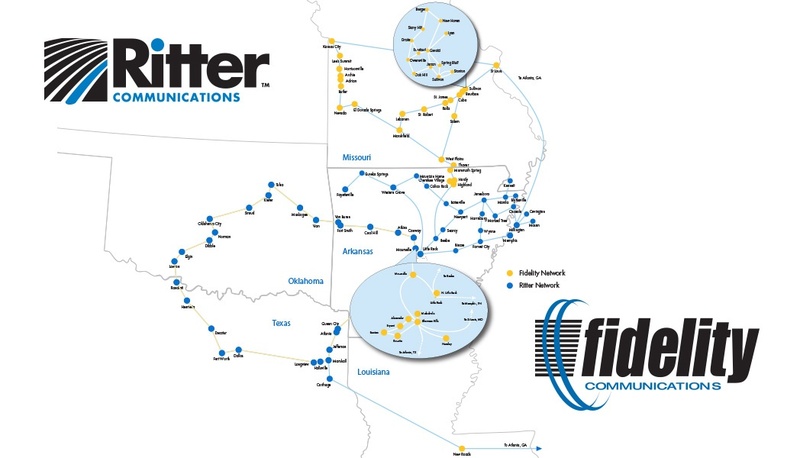 JONESBORO, AR – April 21, 2015 – Ritter Communications and Fidelity Communications have partnered together to offer more regional direct connectivity along a high-capacity express route linking Dallas, TX and Memphis, TN. The fiber route provides a regional broadband transport network with capabilities of up to 100Gbps per connection. It will allow high capacity links to markets such as Oklahoma City and Tulsa in Oklahoma, and Little Rock, Conway and Forrest City in Arkansas—plus direct connectivity to fiber distribution in the Arkansas communities of Maumelle, Bryant, Benton, Beebe, Searcy and Little Rock, plus Rolla and West Plains in Missouri, and Lawton in Oklahoma. "This partnership brings the ability to deliver broadband capabilities of 10Mbps to 100Gbps from major carrier interconnect points to 80 communities in six states," said Steve Smith, VP of Sales at Ritter Communications. "The unique feature of this route is that it allows direct broadband access at regional hubs, as well as extend that broadband into markets where both companies have extensive rural distribution networks. This helps our customers interconnect with the biggest and most important players in the digital economy." Benefits to customers in areas served by both Ritter and Fidelity will include direct connections to major data carrier hubs, such as Dallas’ TelX facility and InfoMart data center, as well as the Level 3 data center in Memphis. Establishing a connection and presence in these facilities allows more than 100 carriers—nationally and internationally—to directly connect to rural networks in Arkansas, Louisiana, Missouri, Oklahoma, Tennessee and Texas. "This fiber route gives companies of all sizes greater access and opportunity in today’s digital marketplace," Smith said. The partnership leverages common strengths and commitments from each company to provide improved benefits. "Both Ritter and Fidelity believe in investing in high-capacity connectivity for rural communities," said Ritter President Alan Morse. "Interconnection drives innovation and that’s how ideas spread, how businesses accelerate and how opportunities expand for our customers." "We’re constantly seeking to serve our ever-increasing customer base by developing win-win scenarios using technology partners," said Fidelity President John Colbert. "Fidelity continues to grow and we’re excited to augment that growth with an alliance with Ritter in delivering greater connectivity along this high-capacity and high traffic route between Dallas and Memphis." To see a map showing the combined network footprint, please click here. You can also visit www.rittercommunications.com or http://www.fidelitycommunications.com for more information. Ritter Communications, founded in Marked Tree, Arkansas and headquartered in Jonesboro, began providing local phone service in 1906. Today, Ritter serves 59 communities and more than 45,000 customers in northeast and north central Arkansas as well as west Tennessee with advanced voice and data services typically found only in major metropolitan areas. Ritter invests heavily in the communities it serves by deploying proven, best-in-class infrastructure and technology while coupling it with a world-class customer focused experience. Based in Sullivan, Missouri, Fidelity Communications has a history of success through innovation. Fidelity provides residential and business services to more than 75,000 customers within certain communities in the states of Missouri, Oklahoma, Arkansas, Louisiana and Texas. Since 1940, Fidelity has been committed to bringing the latest technology and services to the customers it serves. In just the past five years, Fidelity has more than doubled in size and now employs over 400 people.